Saucy Porka features home-style cooking that blends the bold flavors and spices found in Puerto Rico, South East Asia, China, Japan and Korea. The Chicago restaurant concept grew out of a successful food truck, and now has two brick-and-mortar locations. Seasonality affects restaurants across the country. When temperatures drop, so does foot traffic, and then revenue. 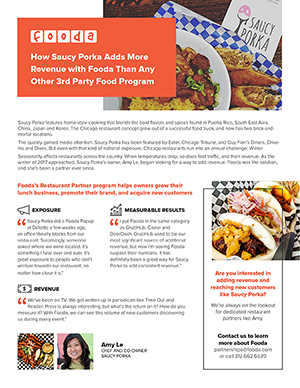 As the winter of 2017 approached, Saucy Porka’s owner, Amy Le, began looking for a way to add revenue. Fooda was the solution, and she’s been a partner ever since. Fooda is available in Atlanta, Austin, Boston, Chicago, Dallas, Denver, Detroit, Houston, Los Angeles, Orange County, Milwaukee, Minneapolis, Nashville, New York City, Philadelphia, Phoenix, San Jose, Seattle, and Washington D.C.